Outgoing Rep. Martha McSally has been appointed to fill former Sen. John McCain's seat just over a month after losing the race for the state's other Senate seat. Arizona Gov. Doug Ducey announced her appointment Tuesday morning, just days after Sen. Jon Kyl confirmed that he was stepping down from the role. In the press release announcing her appointment, Ducey said that McSally "is uniquely qualified to step up and fight for Arizona’s interests in the U.S. Senate." McSally, a two-term congresswoman, gained national attention when she faced off against Democrat Rep. Kyrsten Sinema this fall as they both fought to take over the Senate seat being vacated by Sen. Jeff Flake's decision not to run for re-election. Sinema won the seat in a relatively close race, with Sinema winning 50 percent of the vote to McSally's 47.6 percent. McSally conceded six days after the election. That election was already a historic one, with Sinema becoming the first female to represent Arizona in the Senate. Now, the state will be one of only a few to be represented by two women. With McSally's appointment, she and Sinema will be the only serving bipartisan pair of female senators representing their state. The only other instance of that happening was in New Hampshire from 2011 to 2017. There are several other pairs of female senators who will be in the Senate come 2019 -- in California, New Hampshire, Minnesota and Nevada -- but the Arizona duo are the only ones of opposite parties. Six-term Republican Sen. John McCain passed away in late August, just days before the Republican primary in the race for Flake's seat, and he had an outsize impact on the race. McSally spoke movingly during her primary night victory speech about how he served as a mentor to her, both because of their military backgrounds and their love of Arizona. "I am forever grateful to have had the chance to know him to learn from him and even to work with him," she said in her Aug. 28 speech. That said, she did not receive an endorsement from the McCain family in the midterm race, even though she and Cindy McCain spoke at the same Election Eve event -- alongside Ducey and Kyl. In spite of the fact that McCain held his seat for decades, it lies within the power of the governor and not McCain's family to determine who will fill the spot until a special election can be held to formally fill it in 2020. At a news conference today, Ducey said that he was grateful that McSally and Cindy McCain "were able to get together and visit earlier this week and clear the air." 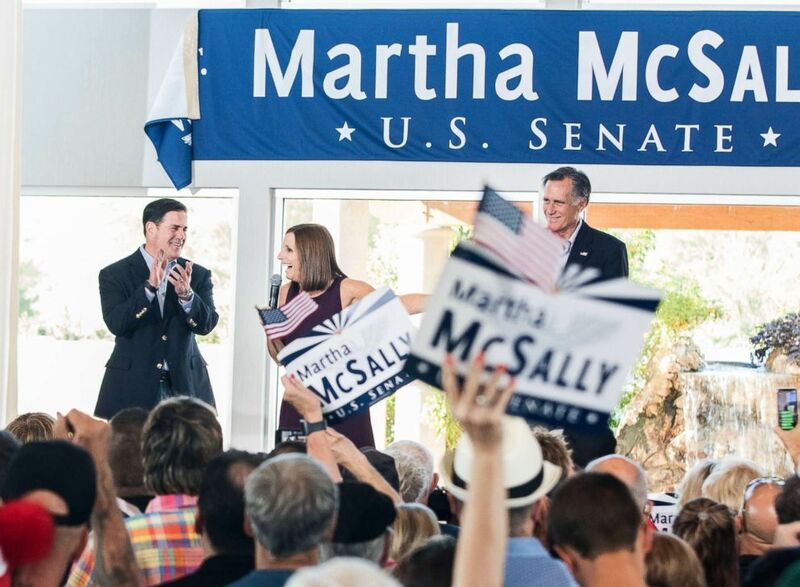 U.S. Rep. Martha McSally address her constituents along with Arizona Governor Doug Ducey, left, and Republican presidential nominee Mitt Romney, right, during a Get Out the Vote Rally, Oct. 12, 2018, in Gilbert, Ariz.
Cindy McCain posted a tweet supporting the decision and calling on McSally to remember her husband's legacy. "My husband’s greatest legacy was placing service to AZ & USA ahead of his own self-interest. I respect @dougducey's decision to appoint @RepMcSally to fill the remainder of his term. Arizonans will be pulling for her, hoping that she will follow his example of selfless leadership," she wrote on Twitter. 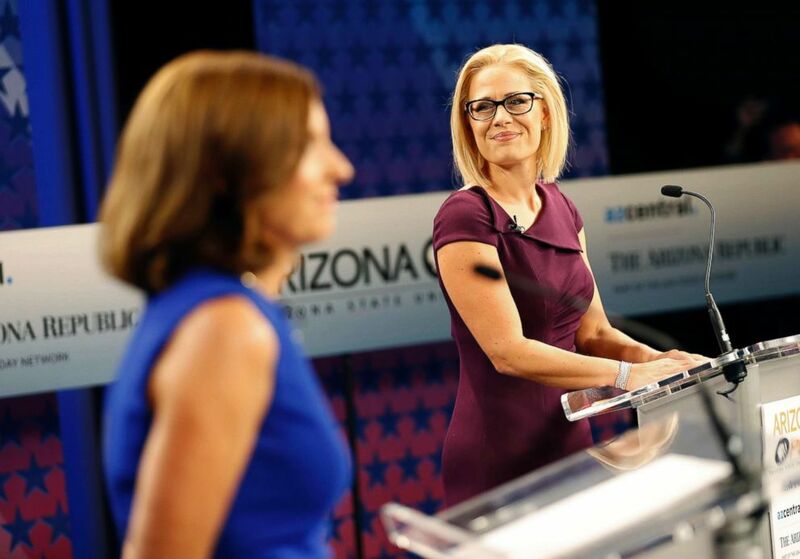 For her part, McSally said that she looks forward to working with her recent rival Sinema -- who she accused of treason during the campaign -- while they both serve as the state's representatives in the Senate for the next two years. "I am humbled and grateful to have this opportunity to serve and be a voice for all Arizonans. I look forward to working with Senator-Elect Kyrsten Sinema and getting to work from day one," McSally said in Ducey's news release announcing her appointment. She echoed that sentiment at the news conference hours later, saying that she texted Sinema this morning and she plans to work with her in the Senate "just like we did in the House." "There's a lot of common ground between us and I'm ready to hit it running," McSally said. Ducey noted that Sinema will be sworn in before McSally, making Sinema the senior Senator from Arizona. He said that decision was made in an effort to "respect the will of the voters." Assuming McSally's appointment progresses, the special election for McCain's seat will be held in 2020, and then would be up for it's regularly scheduled re-election in 2022. Should McSally continue forward, and run for re-election, she will have campaigned three times in six years, losing once. And since McCain won his sixth term in 2016 and Sinema's seat is up for re-election in 2024, Arizonans will have gone through five Senate elections in a decade.